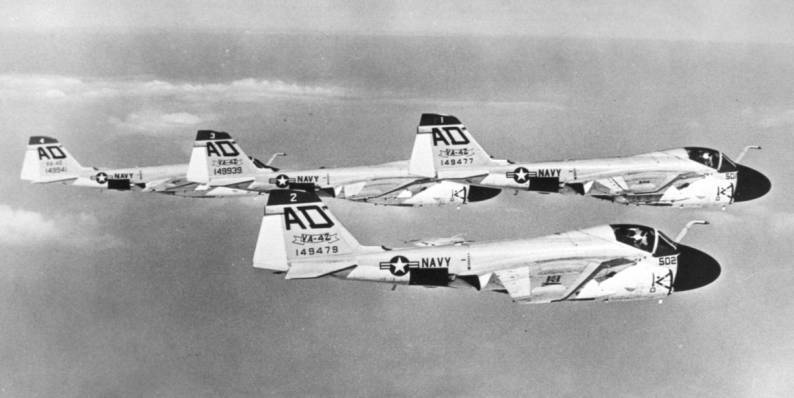 20 Oct–15 Nov 1951: During training operations in the Caribbean, the squadron operated aboard three different carriers. They departed from Norfolk aboard Midway (CVB 41) and then transferred to Wright (CVL 49) while the ships were off the coast of Puerto Rico. A couple of days later the squadron was transferred to Cabot (CVL 28) while operating at sea. Jan–Apr 1956: The squadron operated aboard the Navy’s first super carrier, Forrestal (CVA 59), during her shakedown cruise. 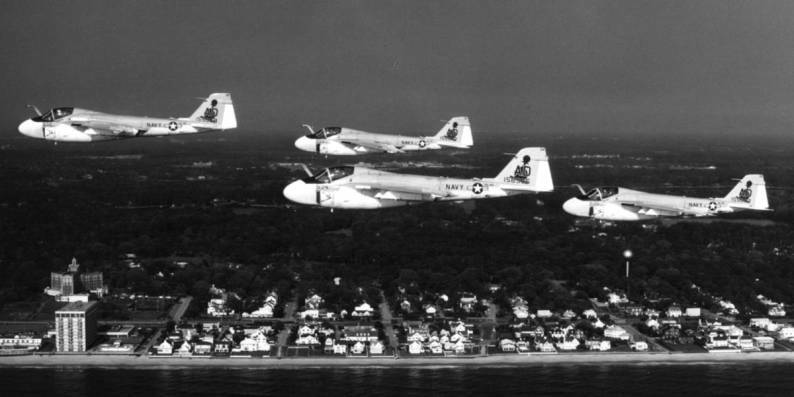 24 Oct 1958: The primary mission of VA-42 was changed to the training of fleet replacement pilots in the AD (A-1) Skyraider. 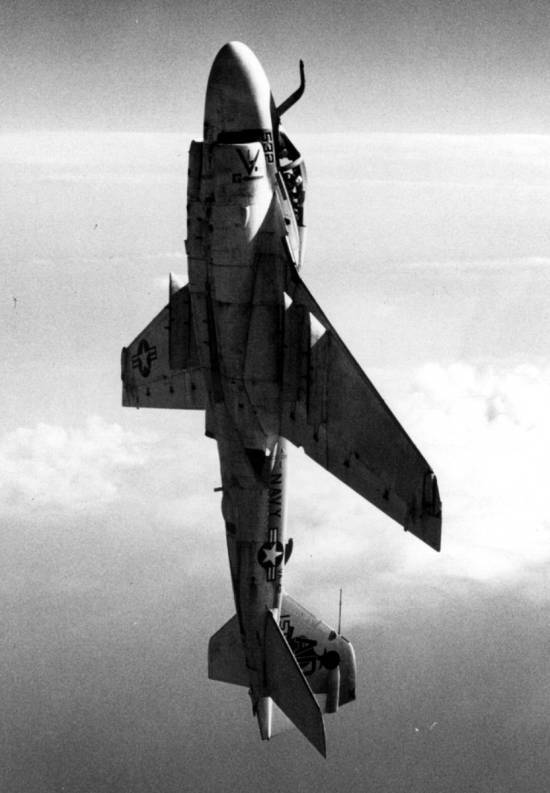 The training involved allweather flight training, low-level navigation flights, simulated special weapons training flights, conventional weapons training flights, and day and night carrier qualifications. 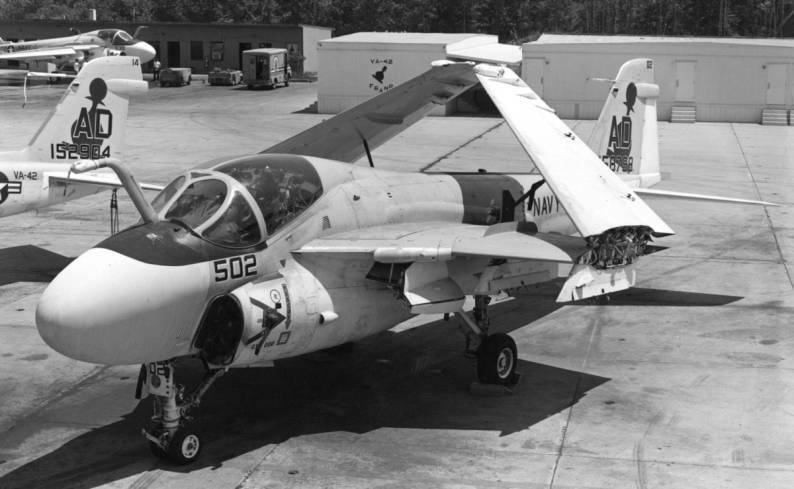 19 Feb 1959: VA-42 graduated its first AD Skyraider replacement pilot. 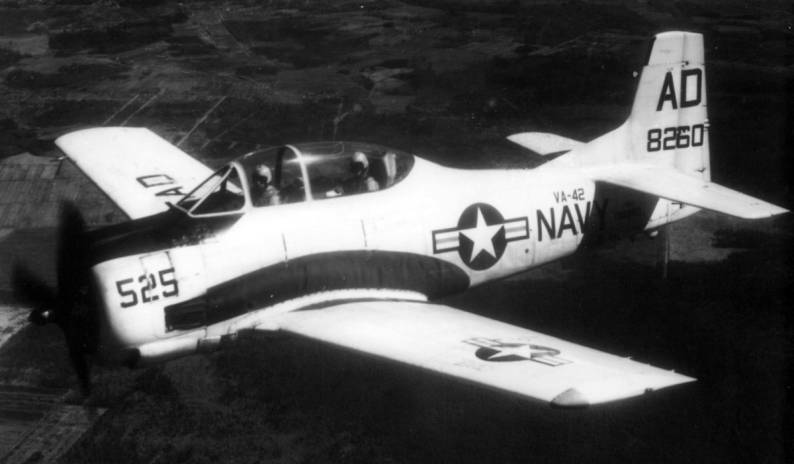 9 Mar 1959: With the acquisition of the T-28B aircraft, VA-42’s instrument instructors used this plane to conduct all-weather flight training for the light attack community. 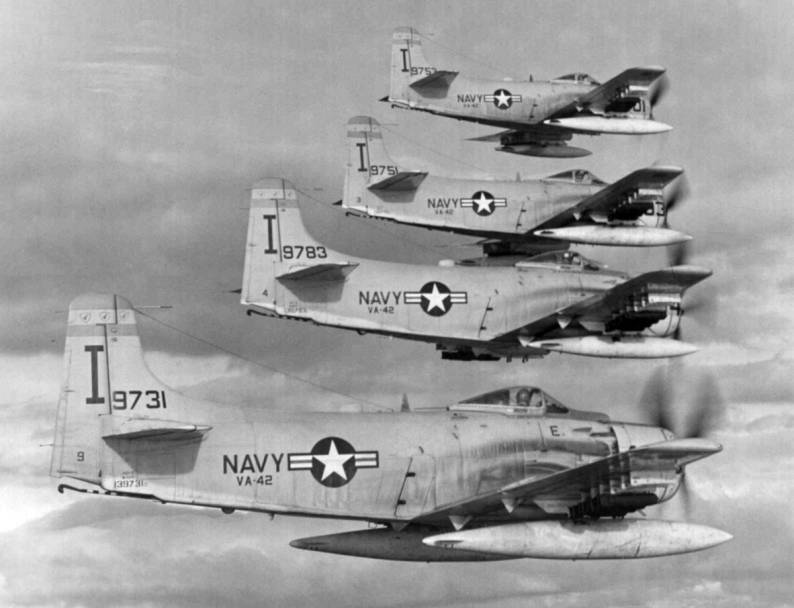 10 Nov 1962: VA-42 pilots flew three A-1H Skyraiders from Argentia, Newfoundland, to Rota, Spain, via Lajes, Azores. 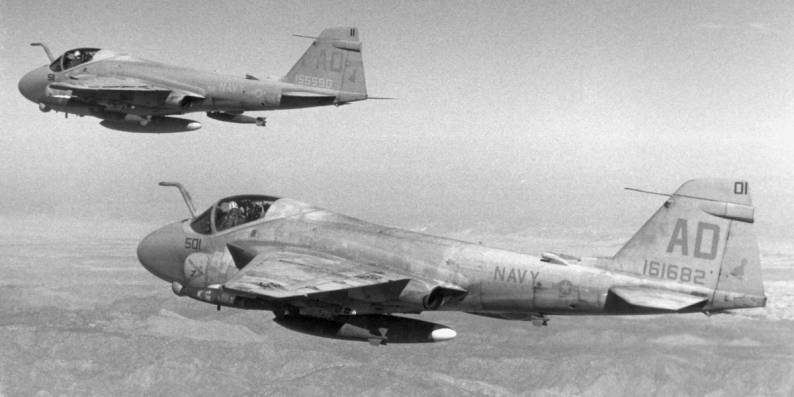 The squadron claims this was the first trans-Atlantic flight conducted by A-1H Skyraiders. 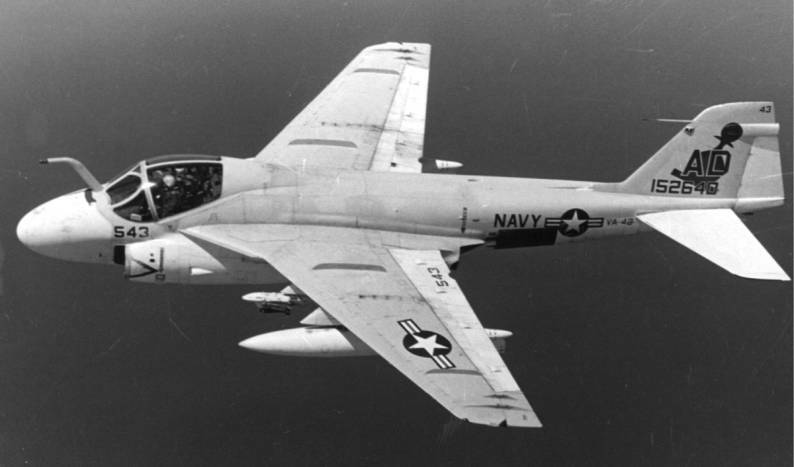 1 Feb 1963: VA-42 became the first fleet squadron to receive the A-6A Intruder. 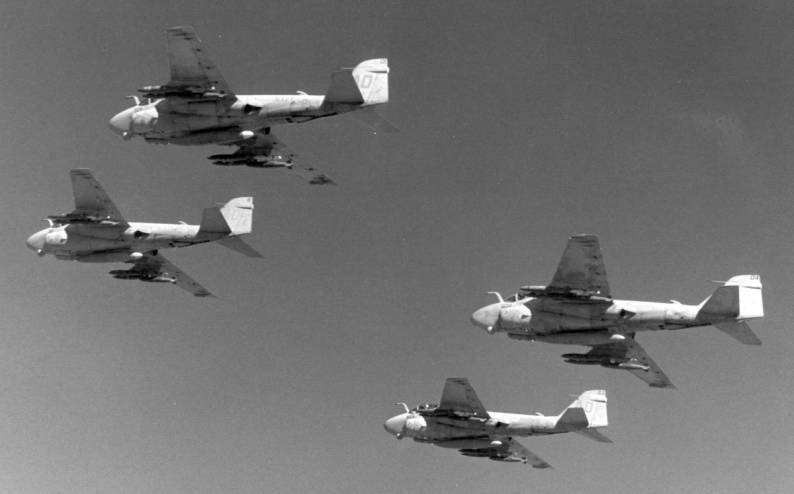 The squadron also initiated the Fleet Introduction Program for the all-weather A- 6A. VA-42’s new mission was the training of A-6A Bombardier/Navigators, as well as its pilots. 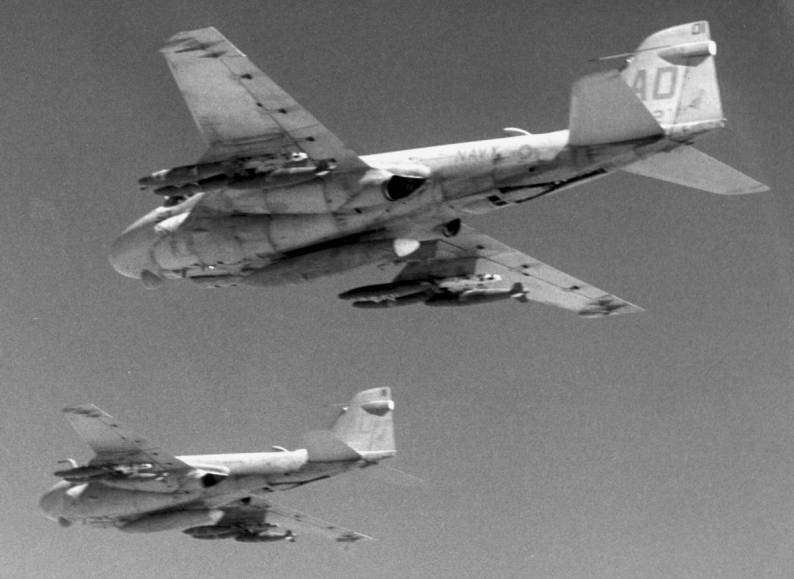 It was also responsible for conducting the A-6A Fleet Replacement Aviation Maintenance Program which trained maintenance personnel. 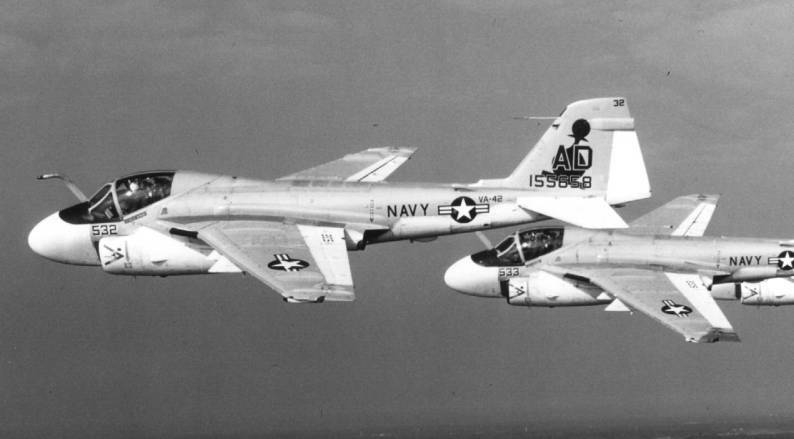 12 Jun 1963: The Green Pawns received the first A-6A (bureau number 149939) with a complete weapon system, thereby permitting the initiation of weapon system indoctrination flight training program for VA- 42’s instructor pilots and bombardier/navigators. 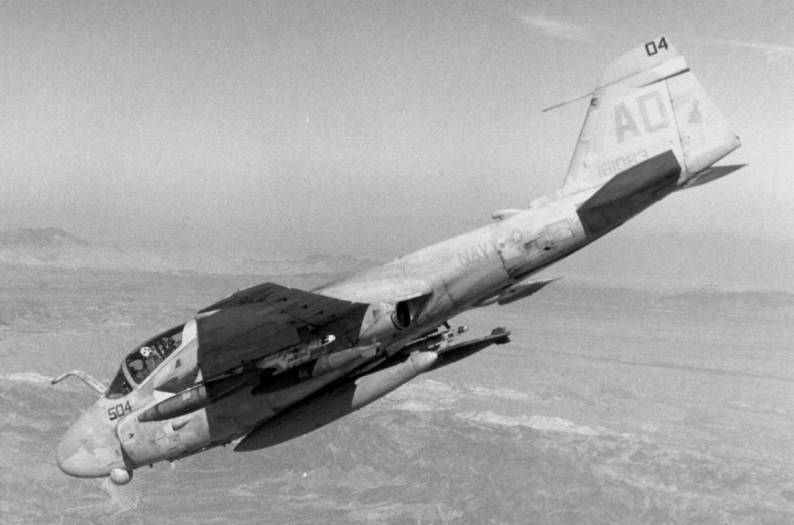 3 Sep 1963: Formal flight training in the A-6A fleet replacement program began with the convening of Class 1-63. 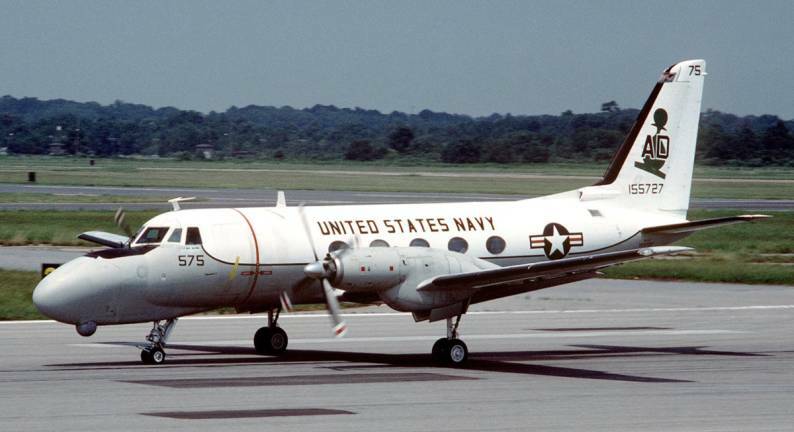 This training was for VA-75 pilots and bombardier/ navigators. 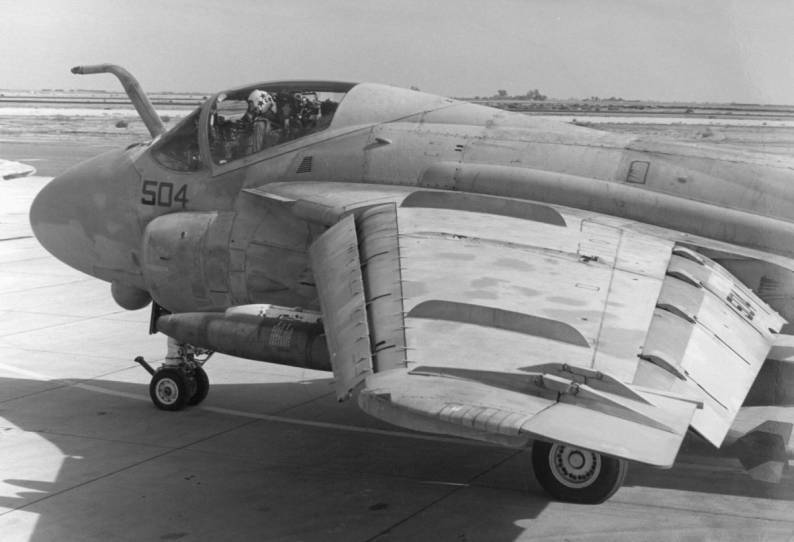 8 Sep 1963: The squadron’s last A-1H Skyraider (bureau number 135324) was transferred. 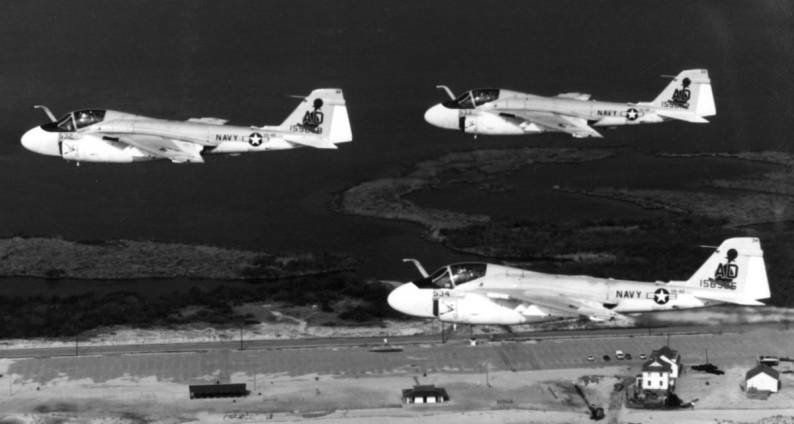 This brought to a close the training of A-1 replacement pilots by VA-42 VA-42 still maintained one A-1E and two T-28Bs for use in propeller instrument training. 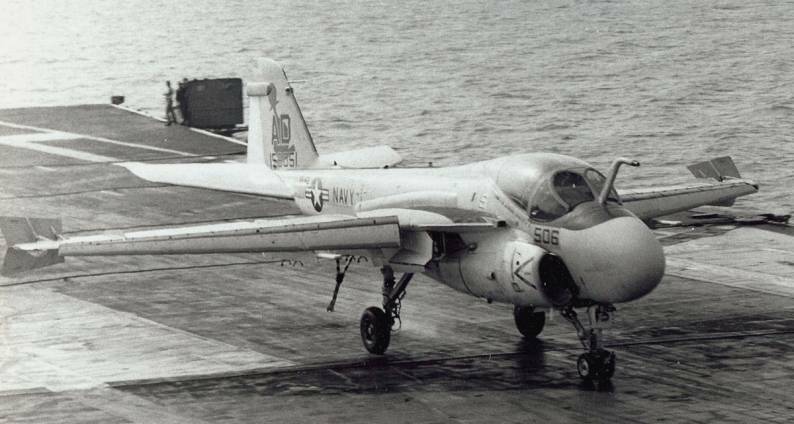 14 Oct 1963: The Green Pawns conducted the first fleet night arrested landings and catapult launchings with the A-6A aboard the Forrestal (CVA 59). 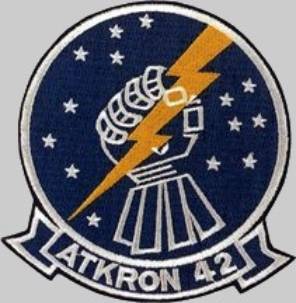 12 Mar 1964: The squadron’s last T-28B was transferred, and the instrument training program for fleet A-1 pilots came to an end. 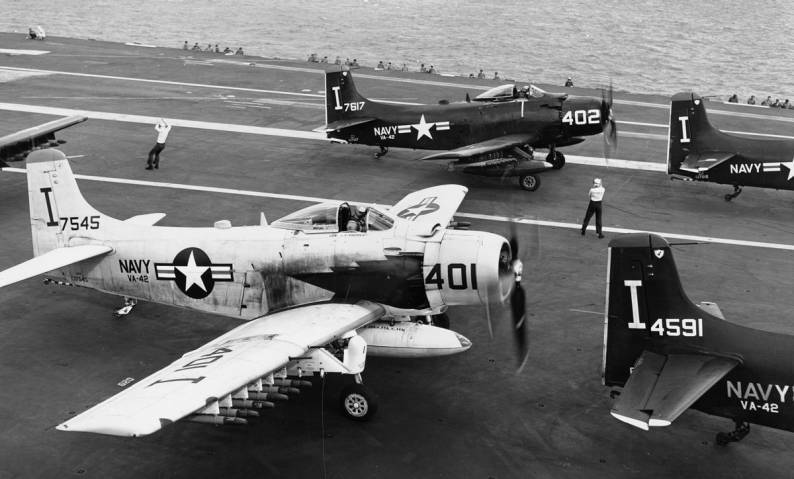 Two days later, their last Skyraider, an A-1E, was transferred. 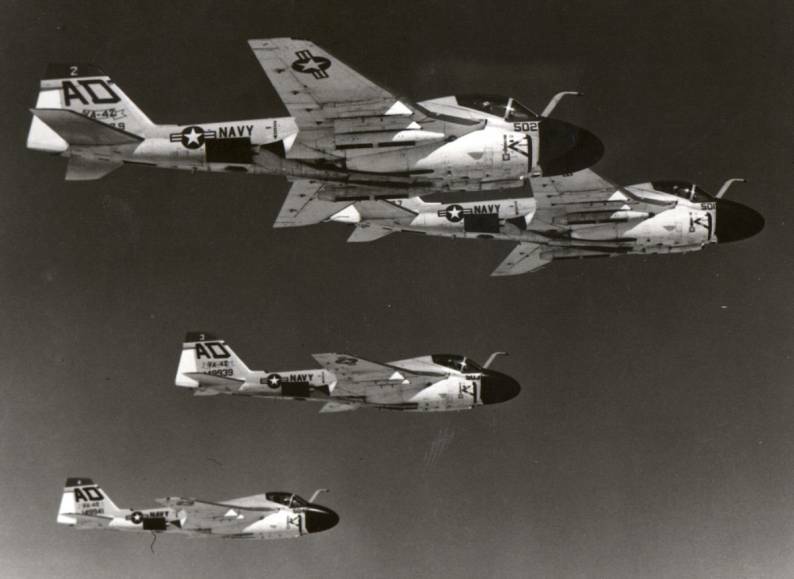 13 Mar 1964: VA-75 became the first fully trained fleet A-6A squadron ready for deployment following successful completion of VA-42’s fleet introduction program on the A-6A. 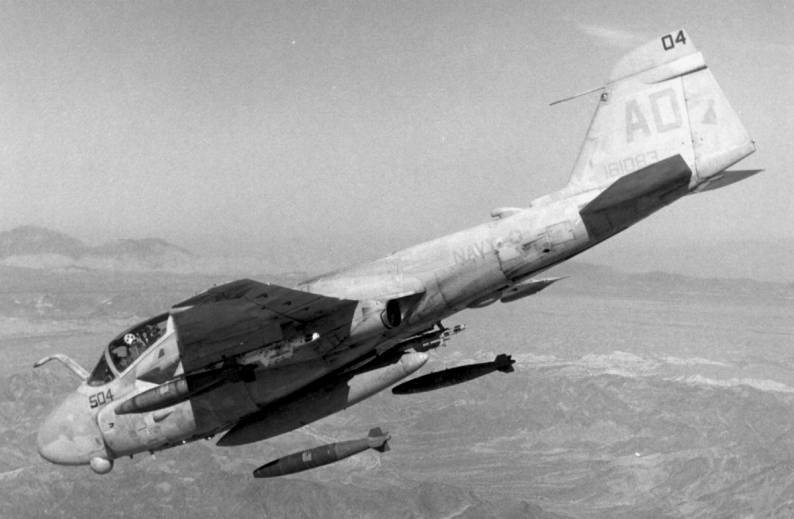 15 Dec 1964: VMA-242 became the first Marine Corps squadron to complete transition training in the A-6A and qualify for fleet deployment with the Intruder. 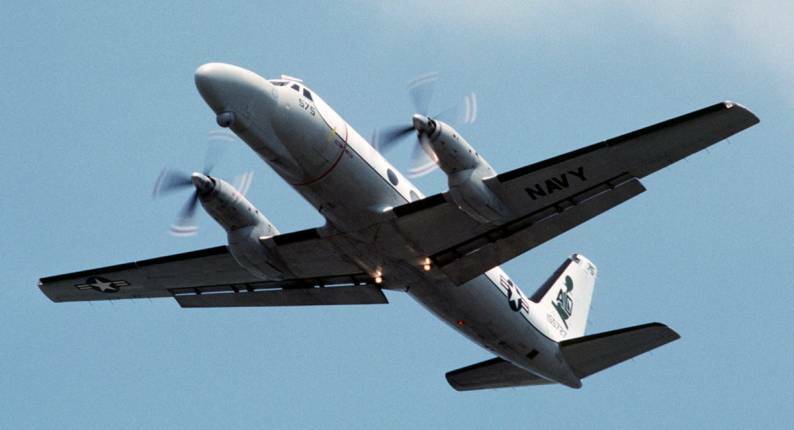 navigator stations, plus ECM equipment, and other radar operational capabilities. 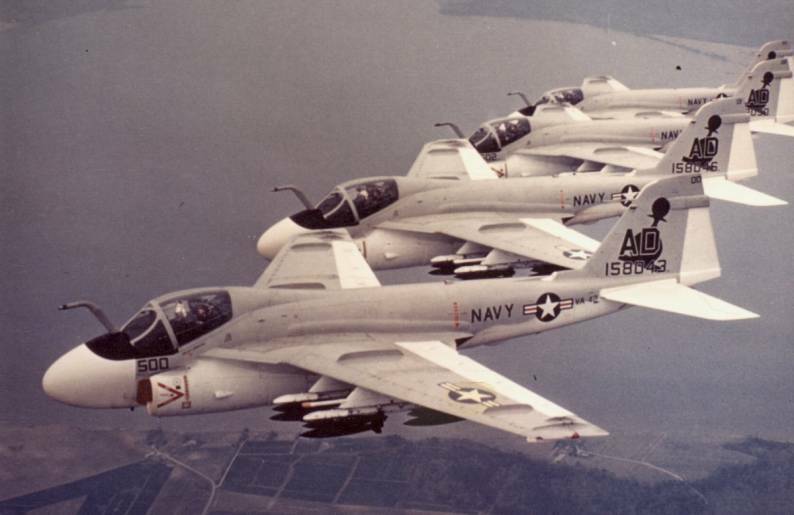 Nov 1968: VA-42’s A-6A pilot training syllabus was modified to include lessons learned from the Intruder’s employment in combat. 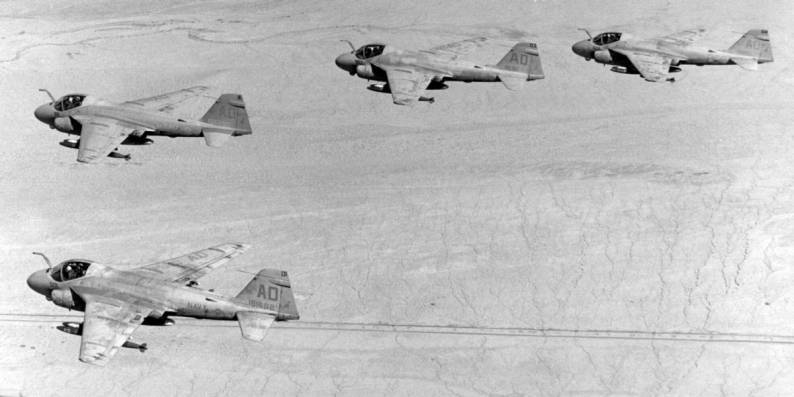 The new tactics phase included air combat maneuvering and Sidewinder missile shoots, while conventional weapons training was made more realistic. 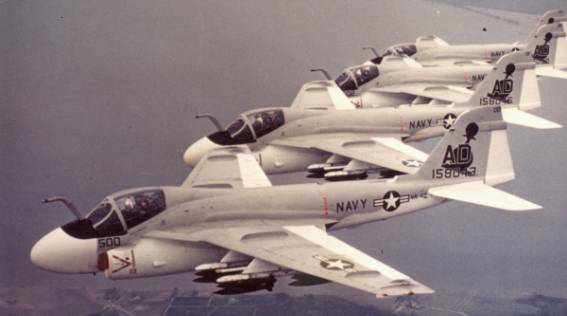 12 Nov 1969: With the acquisition of the updated Intruder, the A-6B, in June 1969, the squadron developed a new training syllabus for the A-6B Standard ARM aircraft and a detachment from VA-165 became the first to complete this course of instruction on 12 November 1969. 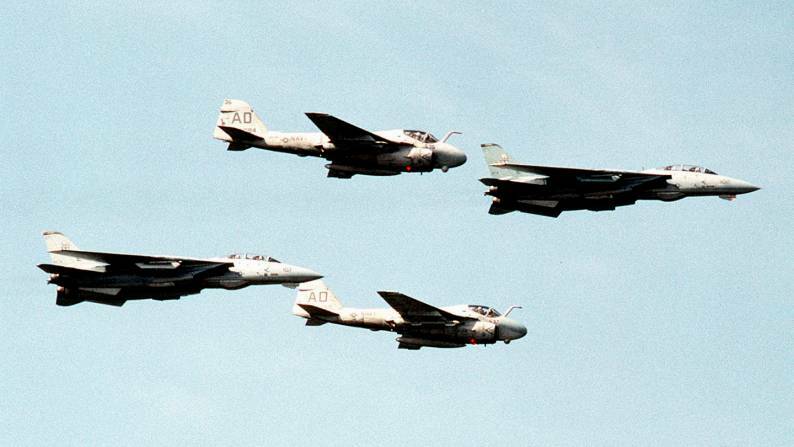 21 Nov 1969: The squadron assumed the duties of providing A-6 orientation training for Air Intelligence Officers reporting to fleet A-6 squadrons. Lieutenant (jg) Erickson became the first Air Intelligence Officer to complete the training on 21 November 1969. 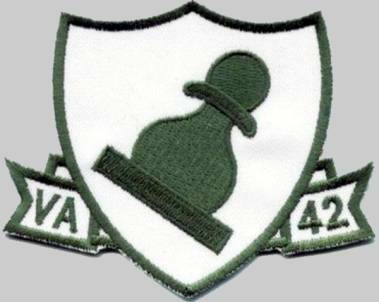 1 Oct 1971: When COMMATWING ONE was established on 1 October, VA-42 was reassigned from COMFAIRNORFOLK to this command, and VA-42’s Commanding Officer, CDR Andrassy, was also assigned as Commander of Medium Attack Wing One, making him dual-hatted. 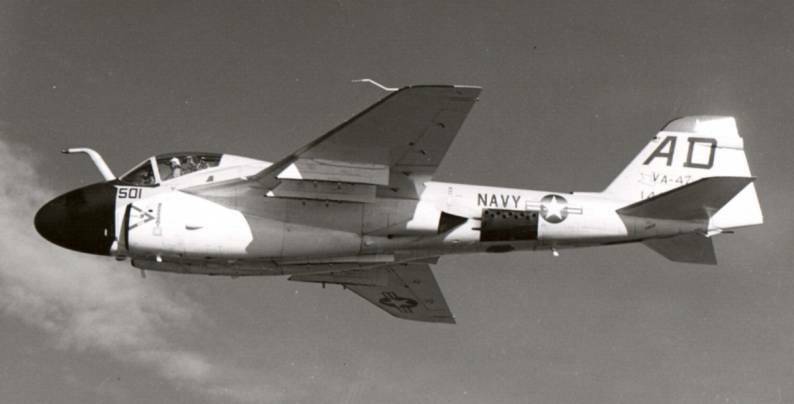 5 Jan 1973: VA-42’s Commanding Officer, CDR Zick, was relieved of his duties as COMMATWING ONE by CAPT Turk ending the dual-hatted role of the squadron’s commanding officer. 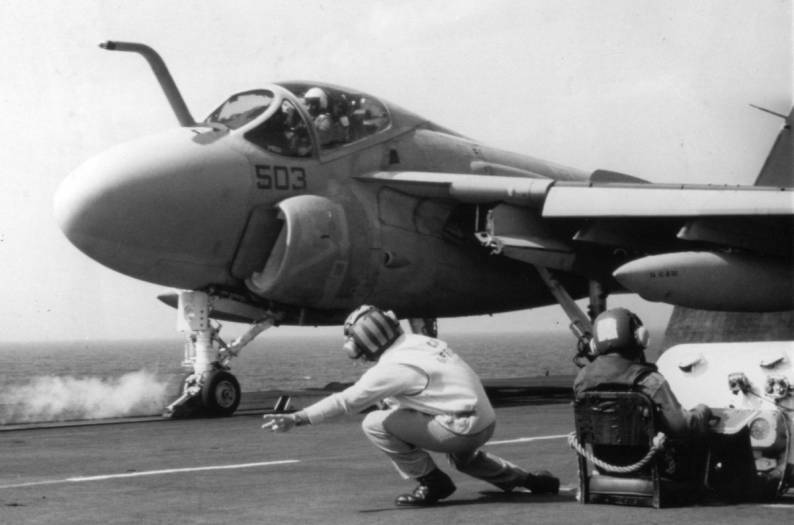 1980: Lieutenant (jg) Beth Hubert was trained as an A-6 Intruder pilot by the Green Pawns and became the first woman naval aviator to qualify as an A-6 pilot. 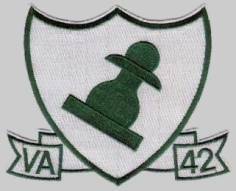 Jan 1982: VA-42 implemented a training program for the Harpoon weapons system. 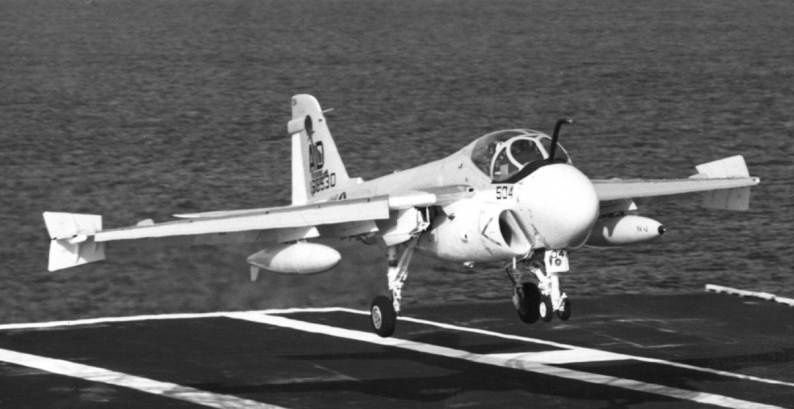 Jun 1982: A VA-42 pilot became the first female naval aviator to make an arrested landing in an A-6 during carrier qualifications on Lexington (AVT 16).